-Who do you imagine your best self to be? I imagine my best self whole heartedly living out my version of happiness! I’m Fearless and deeply guided by my life’s purpose. I am Not inside of a box based upon my race, gender or net worth. I effortlessly convey a spirit of peace, love and courage. Embodying the courage to teach, inspire, serve and live life on my own terms. I’m not standing in my own way, my mind is filled with positivity and I unapologetically choose. I choose Victory over Defeat, Love over Fear and Confidence over Insecurity. -What steps are you taking or have taken, to become that person? I have a motto “Become Who You Are.” In this process of becoming who I am, I Love myself more than ever each day. I’m no longer chasing the desire to be happy. I recognize happiness as a vessel that comes from within and allow it to exude trough me. Being an ambitious young woman, I can be very hard on myself, I’m learning that it’s not that serious and as long as I’m breathing I can continue to strive. I know for sure that what is for me is already mines and within reach. The key is to be tenacious enough to go get it in-spite of it all. -What was the toughest lesson you’ve had to learn? The toughest thing I had to learn is that my mind can work for me or against me. It is my responsibility to shift the energy of fear, doubt, uncertainty and negativity into positive empowering thoughts rooted from belief in myself and my intentions. -What was your “Ah Ha” moment? My Biggest Ah Ha moment was when I decided to STOP comparing my progress to the success of others. I am exactly where I am supposed to be in the story of my life and I am honestly cool with it. As cliché as it may sound but, the outer world reflects your inner world. True Peace with self is a domino effect and makes all of the other virtues easy. You can’t fully be all that YOU are destined to be when you are in the midst of chaos. De-clutter and watch the blessings manifest one after another. -What is your greatest accomplishment? My Greatest Accomplishment is having the courage to “LET GO of THINGS!” It gave me the ability to see life and my true desires through another lens. Becoming a semi-minimalist has introduced me to a lifestyle of liberation. It felt good to get up and move to another coast with 2 small children, no BIG Business lead, job or family on the other side, just my desire to explore. Witnessing my abilities to rebuild a foundation in less than 2 weeks made me feel like I CAN ACCOMPLISH ANYTHING I PUT MY MIND TO! I truly inspire myself to believe in the unseen. 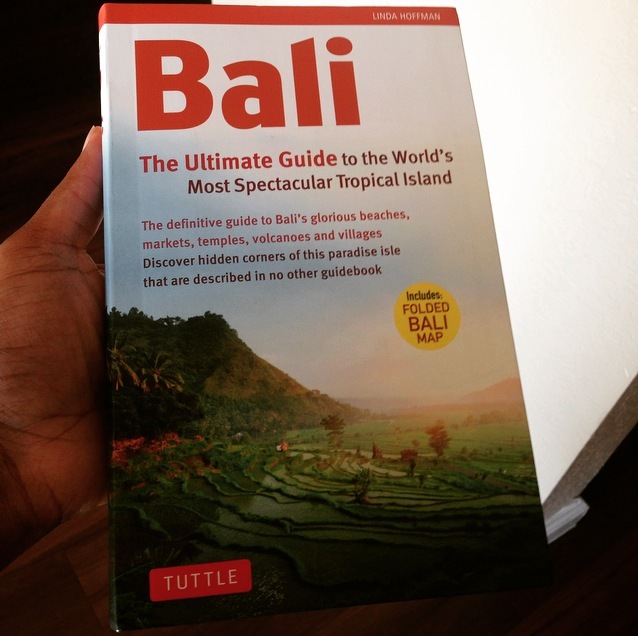 Now, I’m working on grasping the unexpected expat in me that is ready to travel the world starting with Bali, Indonesia this year. 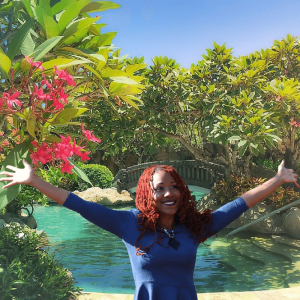 The fact that I know I want to live outside of the country haunts me so I decided to not scale down the Dream to meet my current reality…Instead I’ve expand my reach and will not focus on the HOW. I’ll simply keep allowing my heart to be my compass. That in itself is an accomplishment. Won’t you say? After I answered the questions, the Ladies Day Off Brand Manager said “Wow…I too can see you in your beautiful courtyard in Bali!” You have to make your vision so clear that you create a visual that not only you can see, but it’s seen so vividly by others as well. I research the country’s pros and cons – I even read related books. 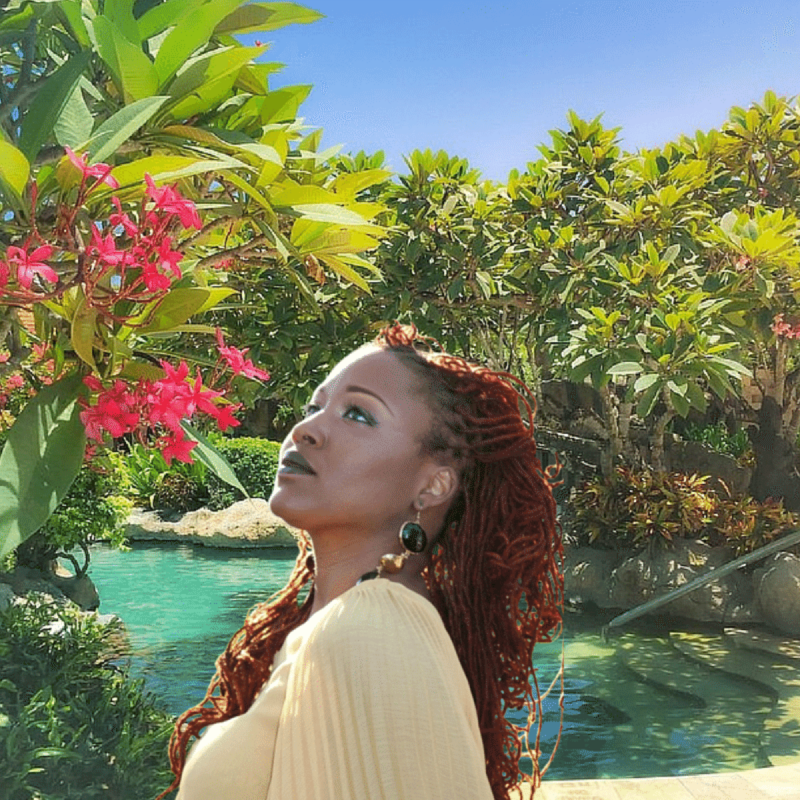 Lately, I’ve been in love with the canva design tool so I found a beautiful picture of Bali and cropped myself in it. LOL This process allows me to have a visual. You too can attract your desires. This process is so amazing because your imagination is the leading force. For me personally, it allows me to put things of importance in prospective. I know that in order to live and sustain this liberated lifestyle I must do the behind the scenes work in my business and continue to cultivate and maintain a positive mindset while taking inspired action day in and day out. I would love to help you do the behind the scenes work to creating the vision you have for your life. Schedule your complimentary session today by clicking here.